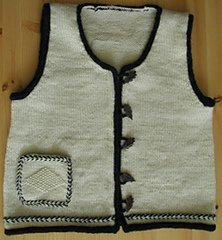 This vest is trimmed with a knitted-in braid which makes the vest look special, and it’s so easy to do! Directions are also included for a crocheted steek. This is a nice alternative to the standard steek which is sewn using a sewing machine.